In my boyhood, two iconic pictures defined the sense of place and history in our community . 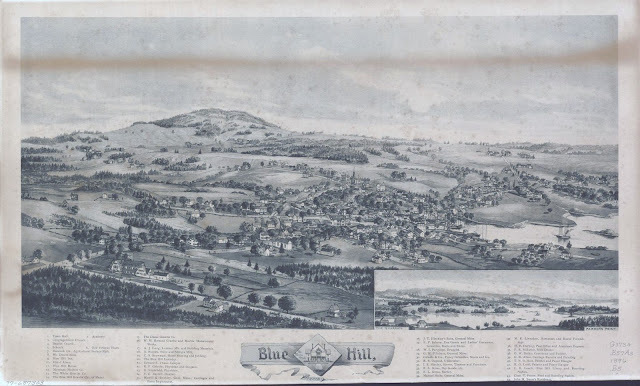 The first was a painting, 'A Morning View of Bluehill Village, 1824' by the Reverend Jonathan Fisher, a Yankee polymath who had come here fresh out of Harvard in 1795 to be the first settled minister of the village. The other was a late 19th century 'Bird's Eye View' lithograph, published, coincidentally, 100 years after Parson Fisher's arrival. Fisher's painting is a summary of his life and career in the town. Although Blue Hill, originally New Andover, was settled in 1762 near the tidal falls at what is now South Blue Hill, the young village at the head of the Bay that Fisher later painted had barely existed before his arrival, but for a couple of houses, and grew and developed in those thirty subsequent years. 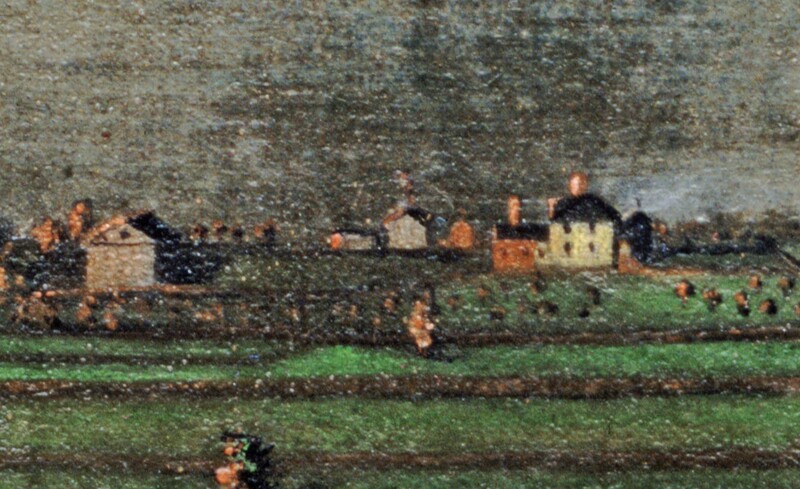 Fisher's journals carefully record his progress on the painting, including traipsing to the Treworgy farm on the next hill (now known as Greene's Hill, after later owners), with his homemade camera obscura, to make the first sketches in September 1824, and then note progress on the work until its completion in April 1825. The village spreads out below the hill, quiet in the morning light. In the foreground a man (Fisher?) drives a snake from this Eden. There were probably roosters crowing, maybe hammers and saws working on the boats under construction at the edge of the harbor, but we can't hear those sounds. All is quiet, frozen in time. 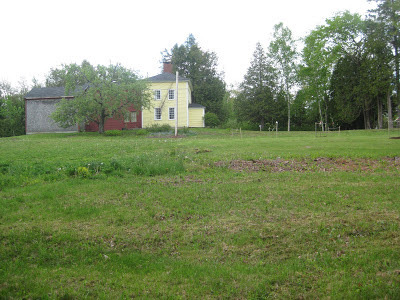 Opposite where he sat surveying the scene, on the top horizon, was Fisher's raison d'etre for choosing this perspective: his own farm, with its tidy orchard, and just downhill to the right, the meeting house where he preached, with the parade ground before it. It is a scrupulously honest picture. In the right middle ground is the Baptist meeting house, to which Fisher, a stern Calvinist, had lost much of his flock when it was founded a few years before. In a village near the Eastern Frontier, far removed from the centers of art, this painting was considered a marvel, and was revered locally long before it found its way into the collection of the Farnsworth Art Museum. 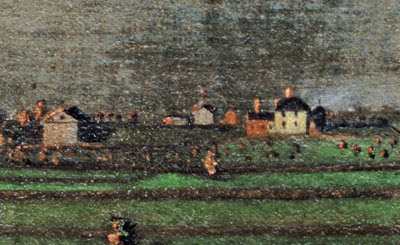 Considered the first true depiction of a Maine coastal scene, it has been published in countless books about American folk art and early 19th century culture. 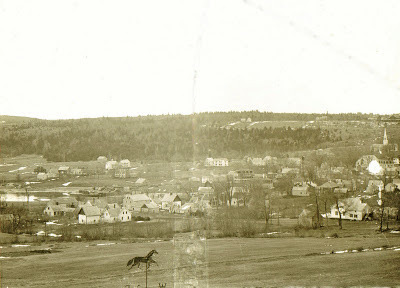 The second view was created by an artist using dozens of photographs taken in panoramic perspective, then mechanically re-aligned so as to appear taken from the air--a dozen years before the Wright Brothers would go aloft, and aerial photography become commonplace. What fascinates and compels me to write about these pictures this morning is that each depicts the view from almost exactly the opposite center of the other--they literally look across to each other. In the bird's eye view, the Treworgy Farm is on the horizon about a third way from the right, and in the Fisher painting, one looks across to the spot that would be directly below the airborne viewer. The village has become quite a different place in the bird's eye view. Fisher's meetinghouse burned in 1842, and was replaced with a new Congregational Church downhill, closer to the center of the village. 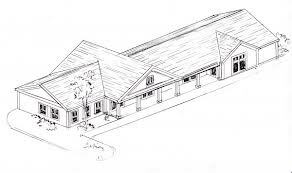 The Baptist meeting house has become a church, with a spire echoing that of the Congregationalists. A main street of stores, with post office and restaurants has grown up at the edge of the harbor. A new town hall, designed by the architect son of a local shipbuilder, has just been constructed, Colonial in idea, but its Roman arched frontispiece clearly inspired by the newly popular classical ideas of the great Chicago Exposition of a couple years before. As with Fisher's painting, a schooner is coming into the harbor, but despite sails, this one has smoke or steam rising from a stack on its deck. 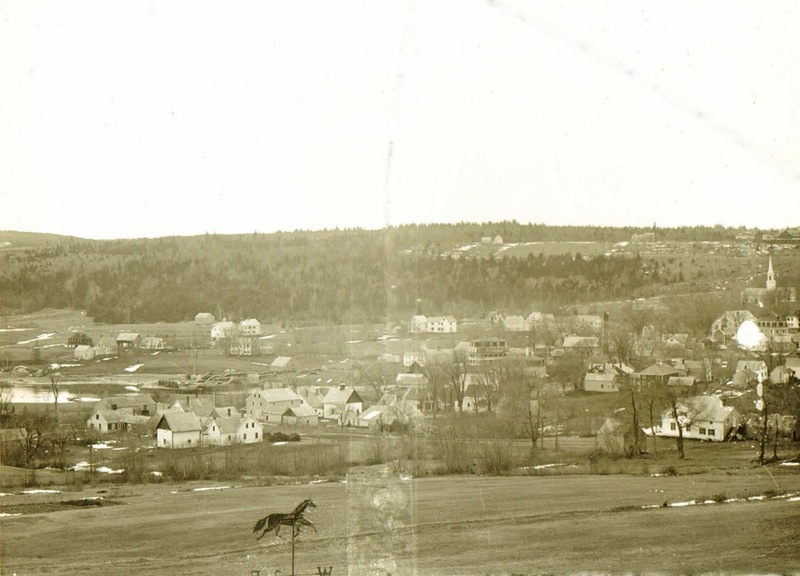 Although Fisher's village still mostly survives, the 20th century is around the corner, and in the foreground is a harbinger of things to come---a big shiny new summer hotel for the newest Maine industry, rusticators. 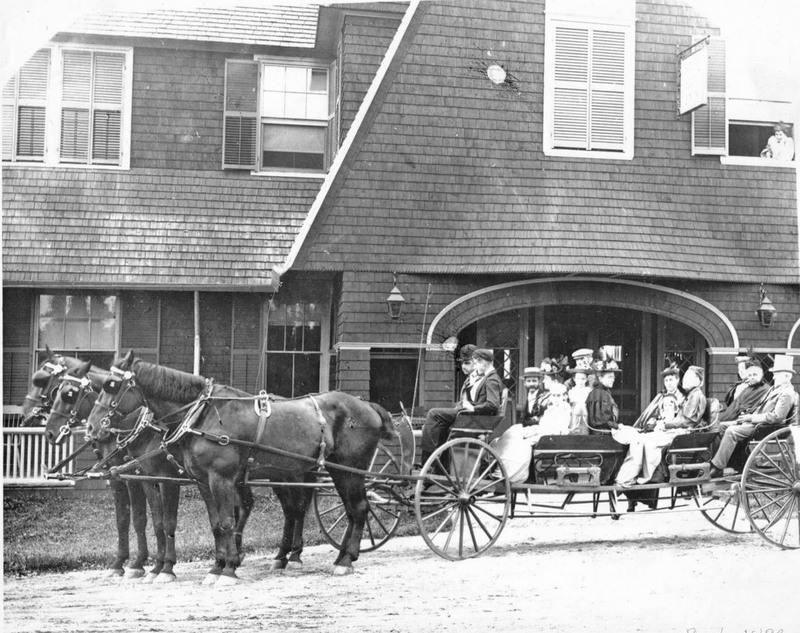 The hotel, the Blue Hill Inn, was designed by William Ralph Emerson, the Boston architect who practically invented the shingled style of summer architecture favored on the Maine coast, and was the latest marvel of the town, complete with its own electric power plant, and supplanted the boarding houses and modest village hotels of earlier years. The Inn was not a success, and with the removal of a wing, was converted to use as a summer cottage by a new owner, Judge Chauncey Truax of New York, in the early 1900s. Later, it served as a temporary hospital, and in the early years of the Depression, it went up in flames. The 21st century is not being kind to the village of the 19th and 20th centuries. Poor planning, lack of zoning, changing tastes, a little greed, changing economies and myriad other factors are wreaking changes on a scale that is unprecedented in our collective memory. Change used to be gradual, and somewhat organic (South Street, new home of both roundabout and Dunkin' Donuts, was still a narrow gravel lane as recently as my childhood). In recent years, the change has come faster, more forcefully, and has been more destructive. Even as I type this, a rotary is being constructed at the dusty crossroads to the left of the Inn, and a Dunkin Donuts is going up on the inn site, across from the supermarket and Rite Aid drugstore that started the commercial sprawl. As to the Fisher homestead, it is preserved as a museum, its original orchard replanted a few years ago (for an article about the Fisher Orchard, click HERE.) But, now only a thousand feet from a car wash and a new commerical parking lot with clear development intentions, the Fisher house's integrity and isolation, which lasted for most of the 20th century, is clearly coming to an end as it approaches its 200th anniversary. 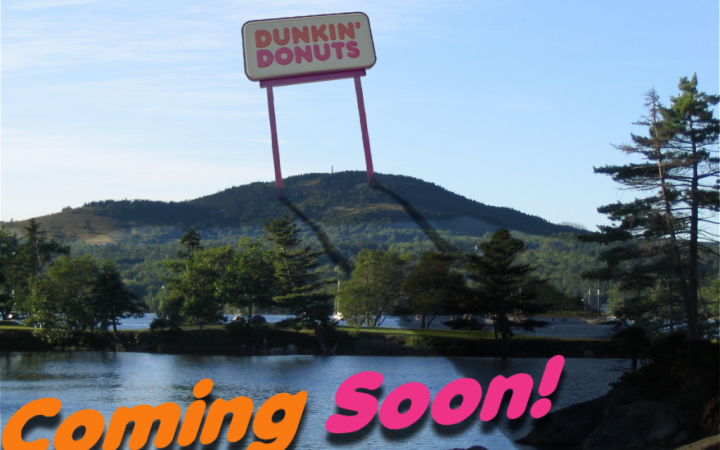 On another note, the photograph below, from the George Stevens Academy on-line student paper, 'The Procrastinator', both sums up the local ambivalence about the arrival of Dunkin' Donuts, and on a more personal note, brings the Dilettante up short, for 43 years ago he was the editor of that school's paper, then called 'The Eagle's Nest'. At that time it was a mimeographed four-sheet (my great contribution was sharper stencil graphics), and the slick advances in technology and content make me feel very, very old indeed. As for Jonathan Fisher, a current exhibit at the Farnsworth Art Museum explores Fisher's ongoing fascination with the natural world in his art and writing, culminating in the book, 'Scripture Animals' (1833). Click HERE for more.